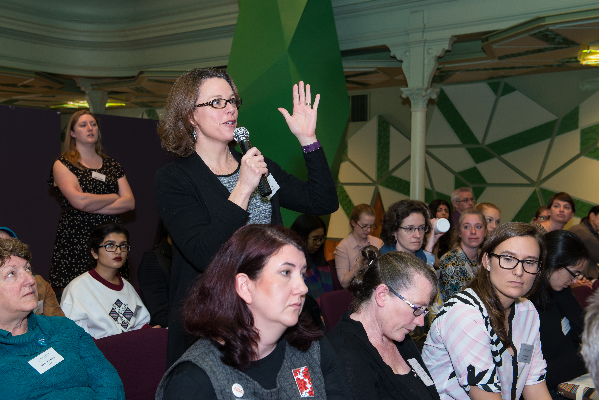 This week we launch the Women in Science AUSTRALIA blog with a post which reflects the “collective voice” of four leading Australian medical research institutes. Thanks to all of the men and women who are part of the Women in Science Parkville Precinct for this blog. While the number of women and men graduating with PhDs in biomedical science has been gender balanced for the past decade, the numbers of women successfully climbing through the ranks to the top of the academic tree are small. So why does this matter? Diversity leads to great discoveries and there is a wealth of evidence in support of interdisciplinary teams. These teams come up with the best ideas and solutions because of their diversity in the range of approaches and thinking styles. Four of the largest medical research institutes in Australia, the Walter and Eliza Hall Institute (WEHI), Peter MacCallum Cancer Institute, Murdoch Childrens Research Institute and The Florey Institute of Neuroscience and Mental Health, have recently joined forces to create significant change in the area of women in science. The leaders of these institutes recognise that in order to find cures they must have the biggest ideas, they must think differently and they must certainly engage all of their brightest minds. The Women in Science Parkville Precinct (WiSPP) collaboration has a goal to increase the number of women who attain senior leadership positions in science. While efforts of individuals within these institutes have resulted in a shift in policies and practices that are helping women stay in science, by joining together, the WiSPP collaborative aims to tackle the broader and bigger issues that limit the progression of women in science. Why are we failing to retain so many talented women? The reasons are complex and multifaceted. Unconscious bias, normalised discriminatory behaviours, absence of role models and mentoring, and pressures of balancing job insecurity with primary carer responsibilities impact on the success of women in science. The WiSPP group have engaged a social change group, REOS partners to assist them in developing actions to be adopted by the four institutes. Financial backing from Perpetual has set this project in motion and the group are looking to engage a business partner who has experience in the area, and is likely to similarly benefit from the outcomes of this project in the longer term. Why is WiSPP different to current women-in-science initiatives? Diversity in the group is key. Equity is everyone’s issue and WiSPP brings together leaders from early career to senior levels and those with experience in policy, industry and academia. WiSPP are also working with the framework of collective impact, a framework that is being applied to many problems to facilitate and achieve large scale social change. Watch this space, as WiSPP channel their collective strength to begin to make inroads to retain some of our best brains in science. Are you a woman in science Down Under? Such an incredible initiative, thank goodness this is happening and kudos to these grand old organisations for recognising the voices of the women in their employ and activating strategies to make a difference. Hopefully we can keep more amazing women in science! Hi! I am really happy to see this get off the ground and am hoping that it expands to other fields of research. Let me know if there’s anything I can do to help.